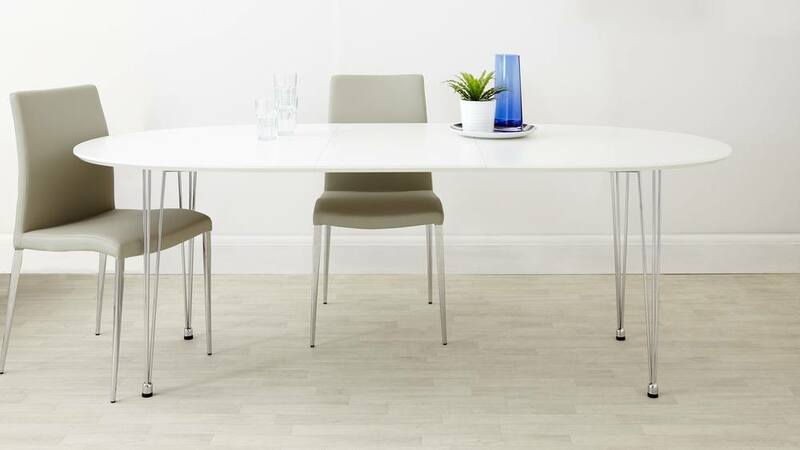 If you're after maximum style with minimal effort, look no further than the Ellie White Extending and Stylo Dining Set. 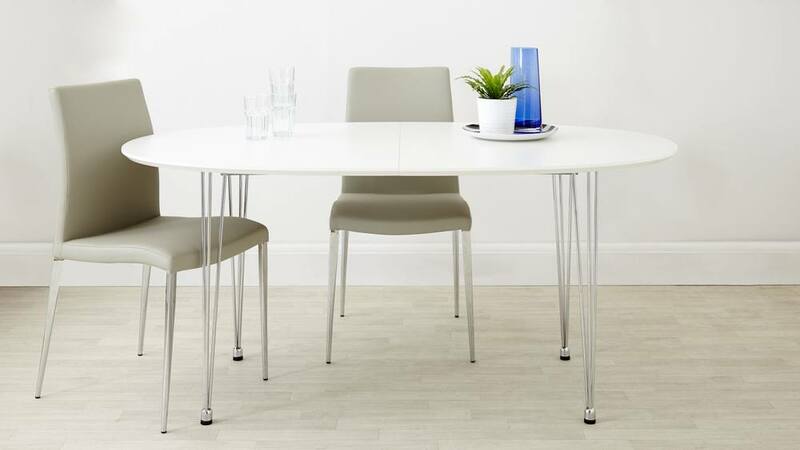 Oval tables create such a sociable setting as family and friends are literally sat around the table. 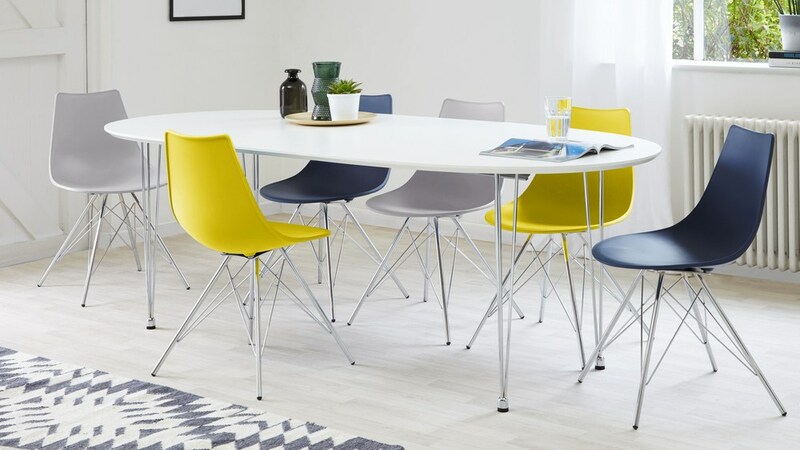 The Stylo chairs are a great pairing with the Ellie as the hand-picked colour palette works great alongside the white satin table top. 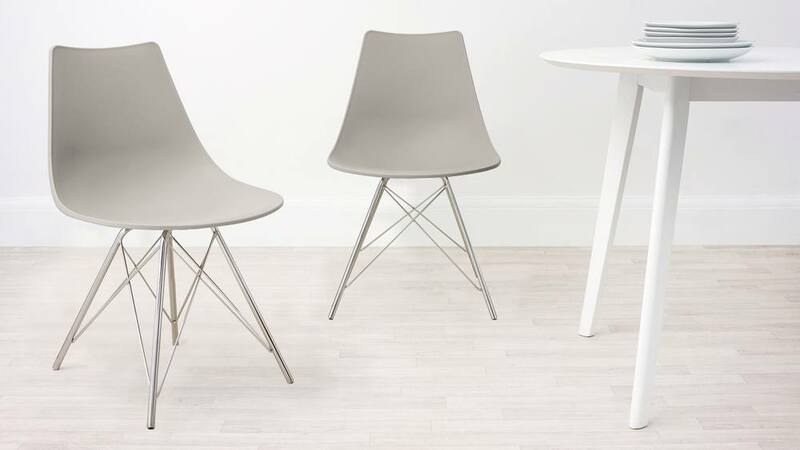 The wire frame chair base coordinates seamlessly with the pin legs of the table to offer you such a designer looking set. 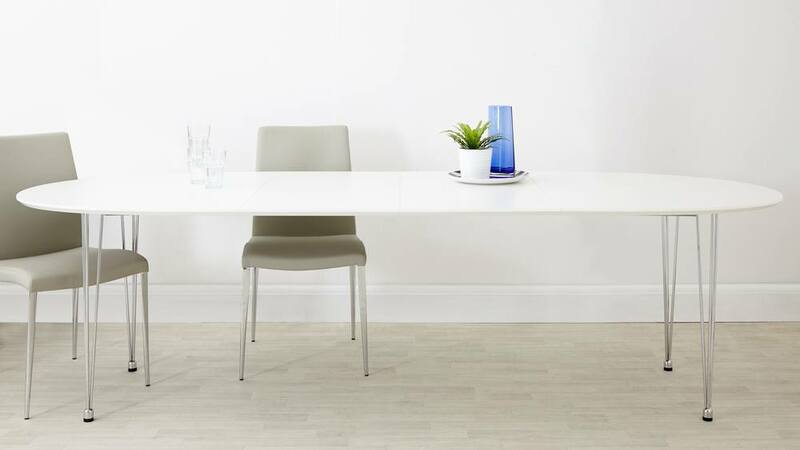 The HPL finish of the Ellie table is one of the strongest, high performing and durable surface materials for the home. 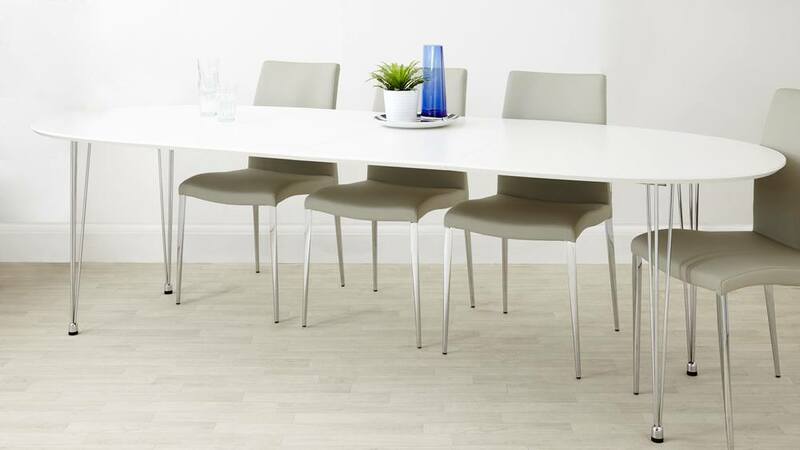 It's perfect for something as often used as a dining table and is ideal for mealtimes when durability is a real priority. The finish of the Ellie is a wonderfully smooth satin matt. This means it isn't reflective but it's not fully matt, so it still has a really tactile feel. 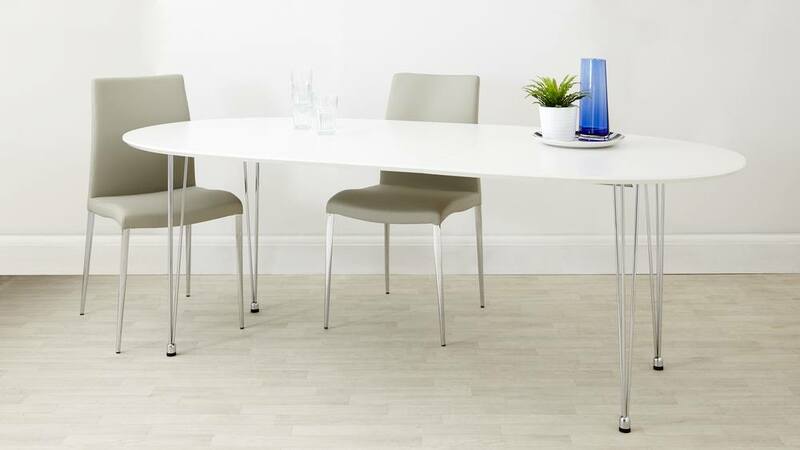 The Ellie table has 2 extension leaves which are stored separately. 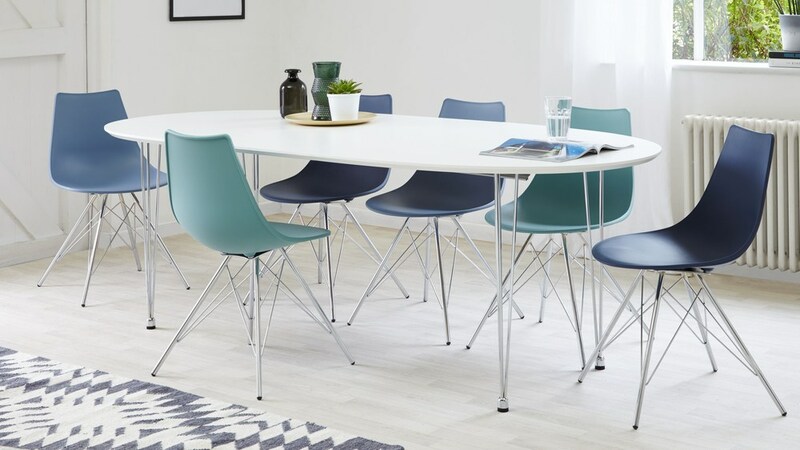 The extensions make this table even more versatile as you can choose what size you need depending on how many you want to seat. 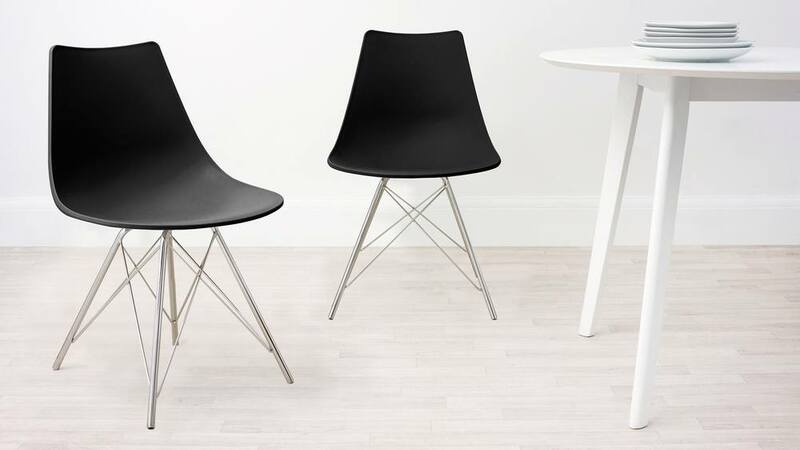 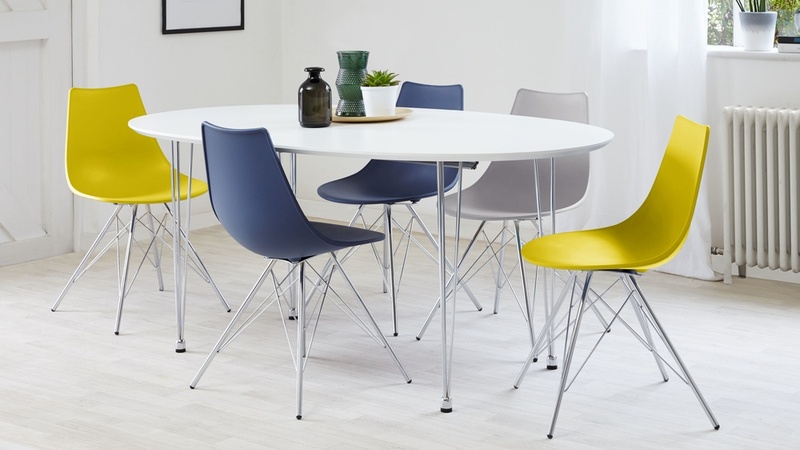 The Stylo is a lightweight but sturdy dining chair, moulded from Polypropylene. This material has such a durable, wipe clean finish that is available in a variety of stunning shades so there's sure to be something that catches your eye! The steel leg frame of the Stylo gives this dining chair an instant contemporary look. 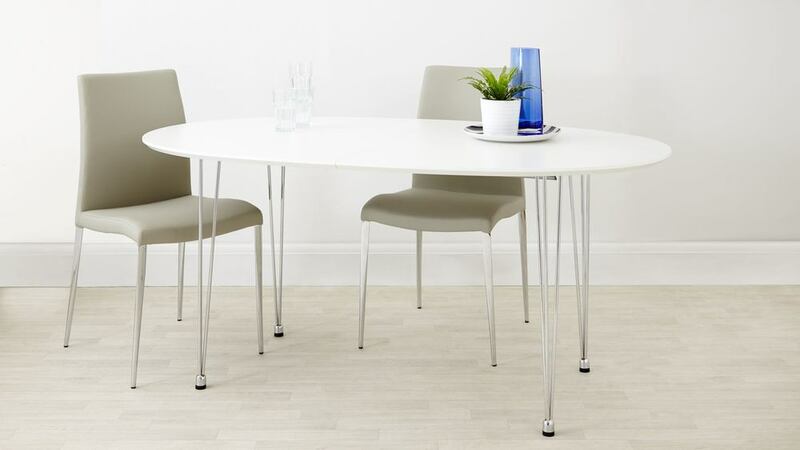 The leg frame is a great styling feature alongside the 3 pin chrome legs of the Ellie, helping to accentuate the overall clean and contemporary look of the set. The floor protectors of the Stylo Dining Chair are actually built into the base of the leg. This is a really thoughtful design feature as it's more discrete than having the protectors attached to the end, yet you still are able to protect your flooring. 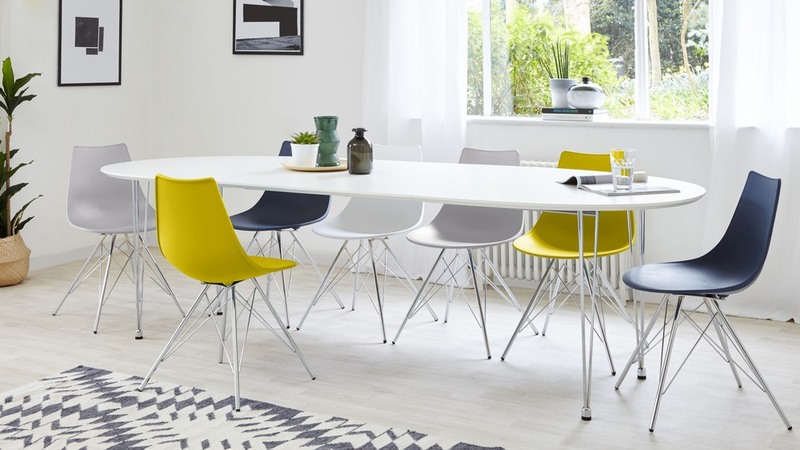 A modern combination for modern homes, the Ellie White Extending and Stylo Dining Set is perfect for bringing everyone together for mealtimes. 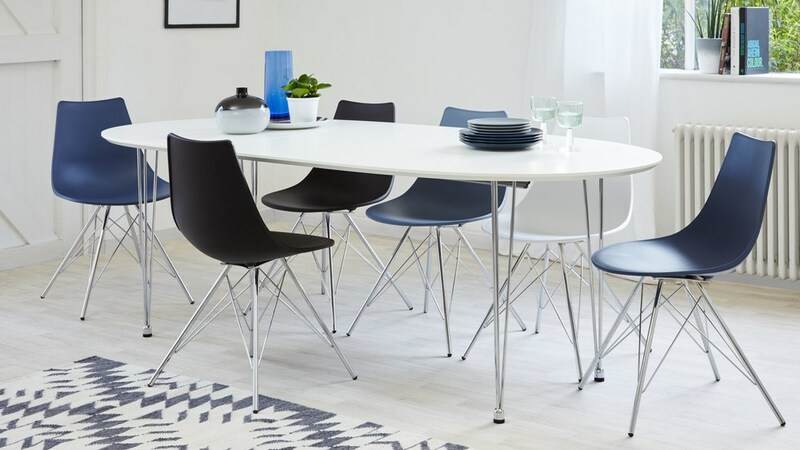 For more information, you can also view the Ellie White Oval Extending Dining Table and Stylo Dining Chair individually. 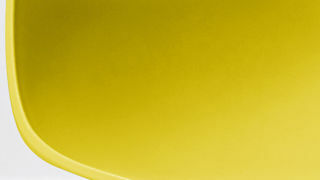 HPL is considered to be one of the most durable decorative materials. 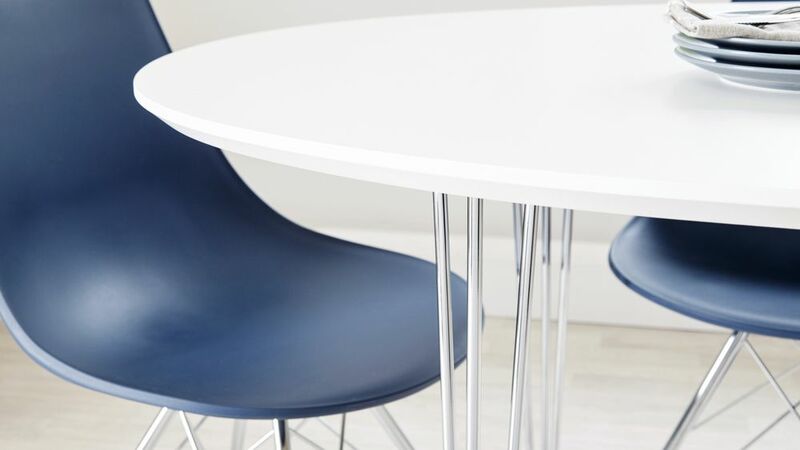 It is used for a whole variety of surface finishes such as countertops, tabletops and flooring so needs to be able to withstand day to day use. 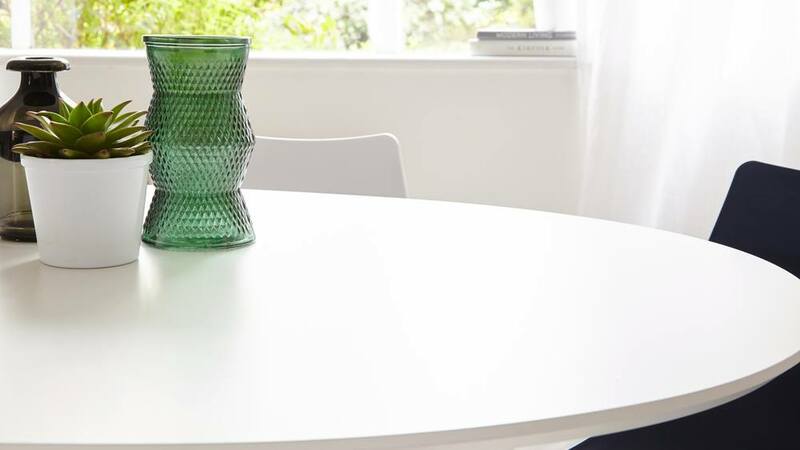 To create high pressure laminate, multiple layers of are saturated with a specialist resin. Then, a decorative film layer (such as a solid colour or woodgrain) is placed on top of the kraft paper before pressing. 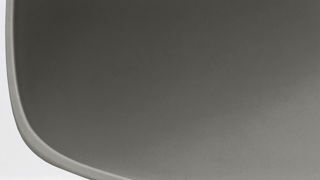 This creates a sandwich effect which is fused together using extreme heat (that’s temperatures of 280 to 320 degrees Fahrenheit!) under 70 to 100 bars of pressure. Then a clear protective overlay is used for maximum protection. 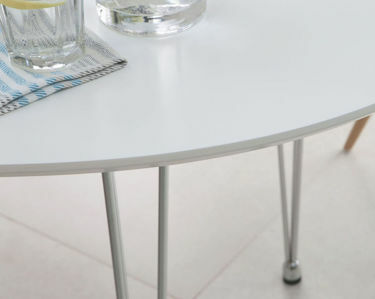 The result of this process is a smooth satin matt finish that is incredibly durable. 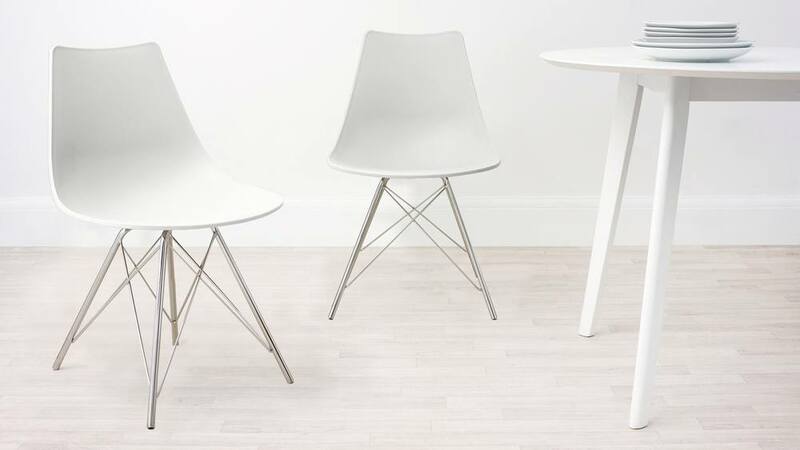 It doesn’t have a reflective shine but it’s not fully flat matt, so it still has a wonderfully tactile feel.